KING DIAMOND’s noble reign in Heavy Metal has lasted since 1985. With his ubiquitous black top hat and dripping, cross of St. Peter corpsepaint, King Diamond is infamous as he is iconic in the metal scene. For years, he has painted disturbing pictures of wicked grandmothers, ominous horsemen and murderous babies from beyond the grave over the course of twelve albums. Formed from the ashes of MERCYFUL FATE (the first time they broke up) by King Diamond and fellow MERCYFUL FATE bandmates; ex-guitarist Michael Denner and ex-bassist Timi Hansen, KING DIAMOND has made a defining mark on the Horror Metal genre. 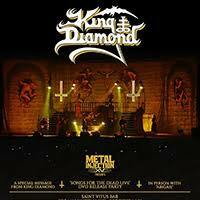 Playing live at the Fillmore Theatre in Philadelphia Pennsylvania, KING DIAMOND plays over an hour of the band’s best material to a roaring crowd who are all too eager to sing along to hits like the first two tracks off of third full-length album “Them”, “Welcome Home” and “Eye of the Witch”. So many KING classics were played and enjoyed with sophomore album Abigail played in its entirety to the end of the show. For a kick of nostalgia for the olde days back in MERCYFUL FATE, KING DIAMOND added “Melissa” and “Come to the Sabbath” to their lineup. King Diamond hasn’t lost his edge or let his crown slip, putting on a solid performance with consistent, theatrical energy throughout the album, singing with his operatic vocal range that could make any 80s Power Metal vocalist green with envy. KING DIAMOND had every intention of burning the Fillmore to ashes that night with solos playing with wild abandon during songs like “Family Ghost”, “A Mansion in Darkness” and “Black Horseman”. You can hear the Fillmore crowd going wild with each new intro to an old familiar song and finally erupting in pulsing chants as the band ended the night with the instrumental “Insanity” from the fifth album The Eye. KING DIAMOND’s dramatic and gore-filled songs are surely as eternal as Abigail’s restless spirit.